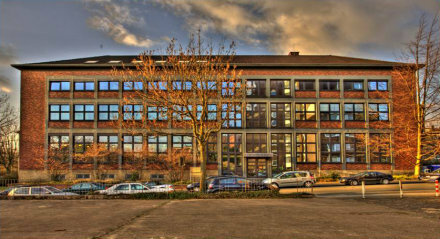 The House for the history of the Ruhr (Haus der Geschichte des Ruhrgebiets) is home to the History of the Ruhr Foundation (until 2015 History of the Ruhr Foundation) and the Institute for social movements. As an interdisciplinary institution within the Ruhr-University of Bochum, the ISB is linked with the foundation through a public-private-partnership. Both institutions offer students, researchers and the interested public a wide range of services – in particular with regard to social movements and the past and present of the Ruhr region. The “Haus der Geschichte” holds the stock of the Library of the Ruhr (Bibliothek des Ruhrgebiets) − a scientific library consisting of circa 450.000 media − and the Archive in the House for the History of the Ruhr (Archiv im Haus der Geschichte des Ruhrgebiets). Books and records can be used in the house's reading room.